Brand New Wallenstein Model WX470 20 Ton Horizontal & Vertical Skidsteer Logsplitter. 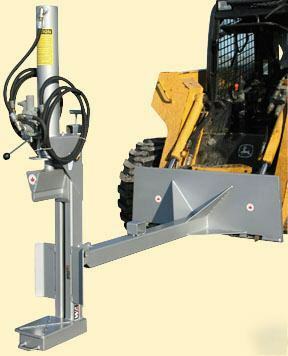 * This Log Splitter can be used in the Vertical or Horizontal positions! * Fits all Skidsteers and Front-End Loaders with the New Universal Skidsteer Quick Attach. Log Splitter comes Complete & Ready to use, including the Hydraulic Hoses!